Dear parents & families, an incident involving police activity occurred on Aviation Blvd. between El Segundo Blvd. and Rosecrans Blvd. near the 360 housing development around 10:00 am this morning. Upon hearing this, we immediately went into a soft lock down and contacted the police. They shared with us that the suspect was already in custody and that we were cleared from lock down. We will ensure there is additional staff presence at the dismissal of summer school today at DVD/DVC at noon. Report cards have been mailed out and I have turned Powerschool access back on Have a terrific summer! On behalf of all the adults here at DVS, thank you once again for trusting us with your children this year. They are a truly wonderful group of young men and women whom we enjoy, admire and respect, and who it was our pleasure leading, serving, and taking care of as best we could. Our teachers will be completing students’ final grades and report card comments over the next 2 days, and we will mail out the report cards on Monday. Though the teachers and counselors will not be answering emails over the summer break, you are always welcome to email me with any questions you have. Again, thank you. 2016-2017 (or as we call it here, “DVS Season 8″) has been our best year yet. Thank you to all of you who attended the Presentations of Learning that your students have worked so hard to prepare! As a reminder, we ask parents to please sign in to register your attendance at tinyurl.com/DVSParentParticipation if you haven’t already done so (you can use this link to register your attendance for any of the events you attended this year). 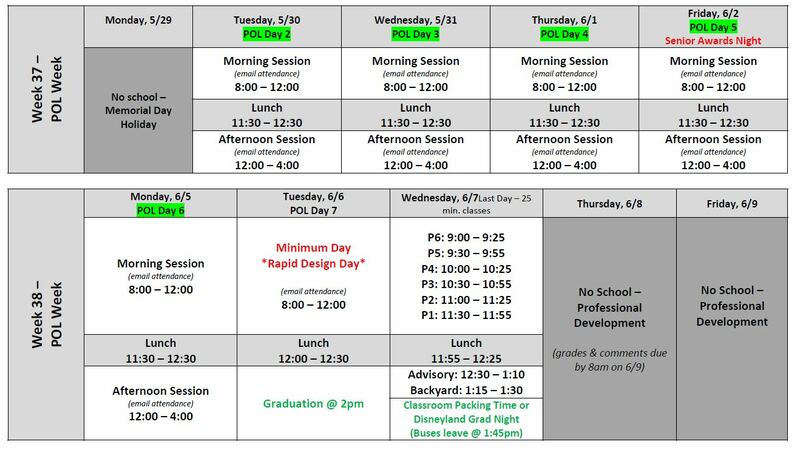 Here is the schedule for the remainder of the school year! We have decided that, due to the logistics of our move into the new campus and the movement of other programs into our current campus, we will not be offering an ACT prep course this summer. We do plan on offering one next winter.